Once the carnage was fully surveyed, photos taken, witnesses deposed, data downloaded and scrutinized, histories examined and lab work done, the NTSB reached its conclusions. It said that among other factors, the May 31, 2014, crash at Hanscom Field in Bedford, Massachusetts, probably resulted from the pilots’ failure to conduct a control check, which would have revealed their aircraft’s gust lock system was engaged. That system prevented the Gulfstream from rotating during its takeoff roll. While most pilots have overlooked a checklist item in their careers, rarely do such slips have fatal consequences. But in addition to the terrible outcome of this oversight in Bedford, what made the missed item so concerning was its frequency. Investigators pulled data from the Gulfstream’s quick access recorder that revealed the accident pilots had neglected to perform pre-takeoff flight control checks in 98% of their previous 175 flights. These were veteran airmen — the 45-year-old pilot-in-command had logged more than 11,000 hr., 1,400 in the GIV, and the 61-year-old right-seat occupant had more than 18,000 hr. as PIC and 2,800 in GIVs. The two had flown together a lot — more than 400 hr. in the previous year and a half. What could cause two such experienced business aviation professionals to be seemingly so casual, even dismissive, about such safety fundamentals and well-known standard operating procedures (SOP)? A lot of things, it turns out. And their behavior was not necessarily unique. There’s abundant evidence that adherence to SOPs may be and has been intentionally disregarded by pilots who believe they have a better idea about how to complete a functional check, fly a VFR pattern into an uncontrolled airport, or are too rushed or too tired or too knowledgeable to follow a company-approved checklist through its entirety. Because of the relatively small size of most flight departments, business aviation pilots, maintenance technicians and flight attendants often develop more personal relationships with each other, as well as with their passengers than, say, do airline personnel. Pilots spend a great deal of time with each other, not only in the cockpit but also during the non-flying hours while on business trips. Irrespective of department size, small group dynamics are commonly in place. Close friendships form among crewmembers and then often to the exclusion of department leadership — department managers, chief pilots, directors of operations are simply not regarded as “one of the crew.” Meanwhile the small working groups tend to develop an informal leadership hierarchy. Noted one chief pilot, “Small groups tend to take care of those personalities they like and can also persecute those who they do not like — those who do not conform.” Many things can impact a flight department’s dynamics, including changes in operations, policy or SOPs; new members; new aircraft; or downsizing, among others. And the actions of management in response to these changes are often received by the department members in unanticipated ways. While a chief pilot may feel that the new policy, person or SOP makes perfect sense, others may not share or understand his view. That’s why good, open internal communication is so important to gaining acceptance. Back then I regarded deviations from the “normal” way of operating, our SOPs, as a personal choice or characteristic of the captain. Others viewed deviations from standards as simply pilot technique. Rarely were any of these considered unsafe practices and yet it was often unnerving to try to keep each pilot’s pet deviation in mind while working in a large flight department. For the roster of pilots in that particular organization, the challenge was to determine what was “standard” and what was “practiced” on the line. So, in effect, we didn’t have a set of standards, rather we had a manual that provided guidance. Years later, the lessons learned there included how not to manage cockpit crews and how the lack of accepted standards by senior pilots on occasion compromised crew resource management (CRM) and situational awareness (SA). Carrie Giles, a professor in the aviation department at Minnesota State University and an airline pilot, noted that noncompliance actions — both intentional and unintentional — “are reduced dramatically when an effective safety culture exists.” Such a culture fosters participation and feedback within an organization. Captains who demonstrate self-confidence and respect for other crewmembers by seeking their input validate leadership and foster team building. A crew practicing these principles is far less likely to bypass a checklist item or disregard a company SOP. Communication within the department becomes a two-way street on which individuals feel that they may participate in the exchange of opinions concerning a particular standard or procedure without the possibility of retribution by senior management. Stockman further opined that the major factors associated with such slips are, “complacency, distractions, time compression, loss of situational awareness, poor communications and lack of fundamental CRM.” Time compression brought about by unanticipated factors, such as the early arrival of passengers, may result in an unintentional noncompliance of an established procedure. Human factors abound within this industry and the one characteristic issue that will often cause personal irritation with crewmembers is the amount of time spent waiting for passengers, a clearance, in line for takeoff, or in holding prior to being cleared for an approach into a busy destination airport. Lest we not forget, waiting is part of the job in business aviation and for the most part, crews are being well paid to be available on short notice. One of my best friends in the industry used to remark, “The boss is always on time regardless of what time he shows up for departure.” In order to be prepared in case passengers might arrive early, most crews have everything ready to go — APU running, clearance on request, coffee made and cabin all set at least 30 min. prior to scheduled departure. All well and good, but what happens in the instance when you are not ready and the boss surprises the crew by showing up an hour ahead of schedule? Is the pace of pre-departure quickened to a point that something gets missed? How many of us have had that occur and in our haste to get underway, dropped the ball with a checklist or function that ordinarily would not be given a second thought? If we are honest we all have been there at one time or another. Each aircraft manufacturer provides a set of operational standards — a flight manual — for the models it produces. Professional training organizations develop departure and arrival SOPs to enhance their clients’ training experience. In addition, manufacturers and training providers develop normal, abnormal and emergency checklists for each aircraft type. Flight departments typically use these tools as the baseline for the development of their company SOPs. Modification of these standards often takes place in order to blend with pre-existing SOPs within a flight organization. Regardless of the origin and longevity of a business aviation flight department, SOPs are a necessity in the creation of a sound foundation of safety, efficiency and effectiveness. The integrity of the operation as well as the professionalism of the personnel requires a comprehensive set of operational SOPs. Standards, as with company policies and procedures, are only as virtuous as the commitment of the personnel to use them. If during flights, department meetings, annual reviews and the occasional exit interview it is discovered that a procedure or standard within the departmental policies is ineffective, attention should be given to discuss and, if necessary, modify the standard. Everyone within the department should have the opportunity to provide suggestions for policy modification. Both formal and informal means of communication should be tapped to solicit input from all staff members. Benchmarking with other flight organizations as to policies and standards is also a great tool for comparison and updating. Simulator training on a regular basis with other pilots from the flight department is a great way to demonstrate adherence to company SOPs and checklists. And professional instructors will notice any lack of SOP coordination when pilots from the same company are not in sync during training. “Train like you fly and fly like you train” is an old aviation adage. If the department adheres to a policy that includes annual or periodic “check captain” rides, SOP conformance may also be evaluated then. An open door policy, a sound training regimen, solid SOPs that have been vetted amongst the pilot group, and a departmental commitment to review and modify as necessary are attributes of a well-managed staff of professional aviators. It is critical to the future success of the flight department’s contribution to the parent corporation that all crew adhere to an agreed-upon set of SOPs. 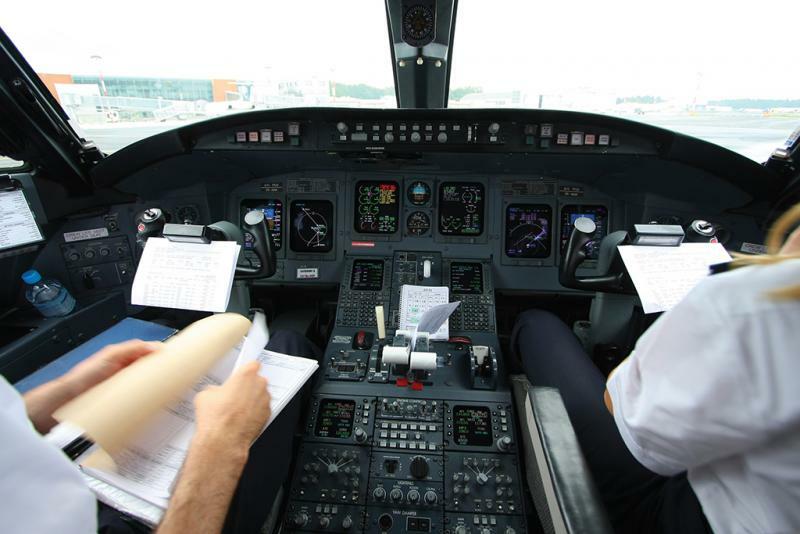 During a flight there are many occasions where crewmembers must use their decision-making and piloting skills to further enhance the quality of the trip. While individual pilot techniques should never be discouraged, the goal of SOP implementation is to provide a universally understood level of safety and process. The end result: Regardless of who is piloting the aircraft, passengers will experience the same professional level of service. Open and timely communication among all flight crew personnel is essential in order to foster utilization and acceptance of SOPs. Business aviation has an excellent safety record. It is important to note that while past performance is certainly a measure of diligent effort, the future of the safety of one’s flight department and the reputation of the entire industry rests on the integrity of each crew to endeavor to utilize the guidance of standard operating procedures and industry best practices.